Well, the adventure has started. 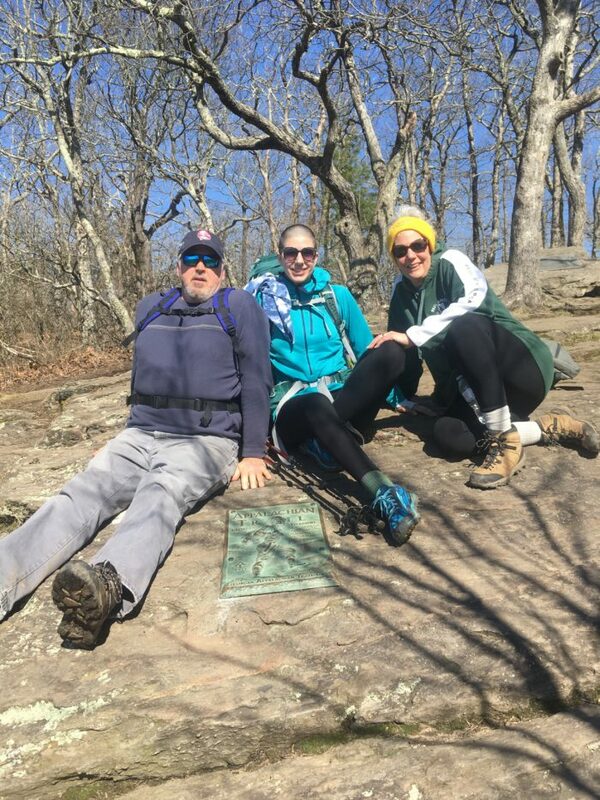 On Thursday, March 22, my mom, dad, Aunt Steph, and I took our first steps under the stone archway at Amicalola Falls State Park. We hiked nine miles to Springer Mountain, the Southern Terminus of the Appalachian Trail. 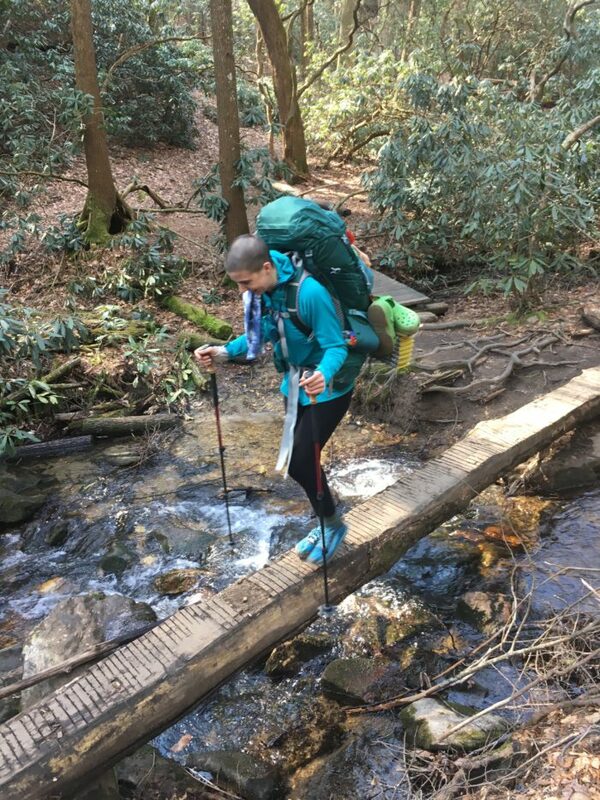 I saw my first white blaze (the white rectangles painted on trees and rocks that mark the trail from Georgia to Maine) and signed my first logbook. I said my tearful goodbye to my family and walked to the shelter. 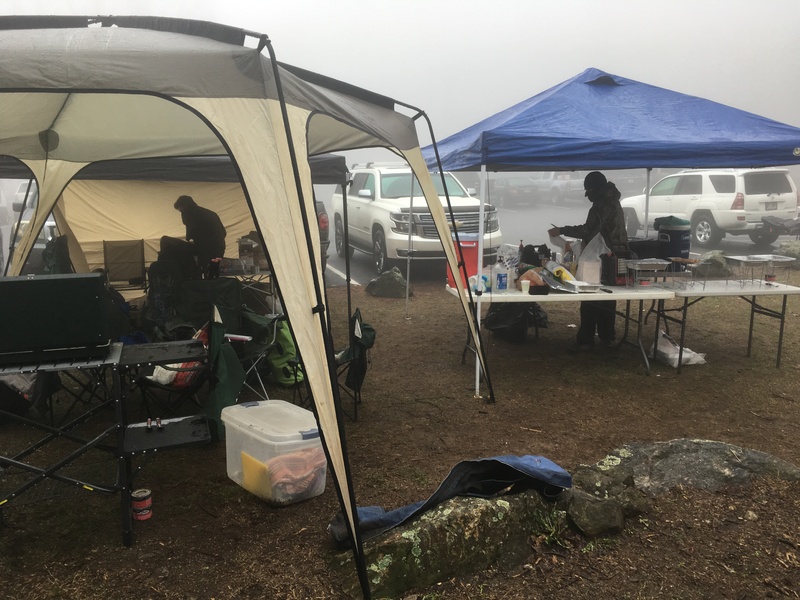 On the first night a badass hiker finishing his SOBO (Maine to Georgia) winter thru-hike stayed at the shelter I was at. It was a lot of fun for me and other first-nighters. We were able to hear his stories and heed his advice, which broke the ice since we were all a little overwhelmed. I climbed into my tent around 9 p.m. and prepared myself for a cold night in the lower 30s. For the first 15 minutes I laid there thinking “I am going to freeze to death before morning,” but eventually my body heat warmed up my sleeping bag and lo and behold I did not freeze to death. 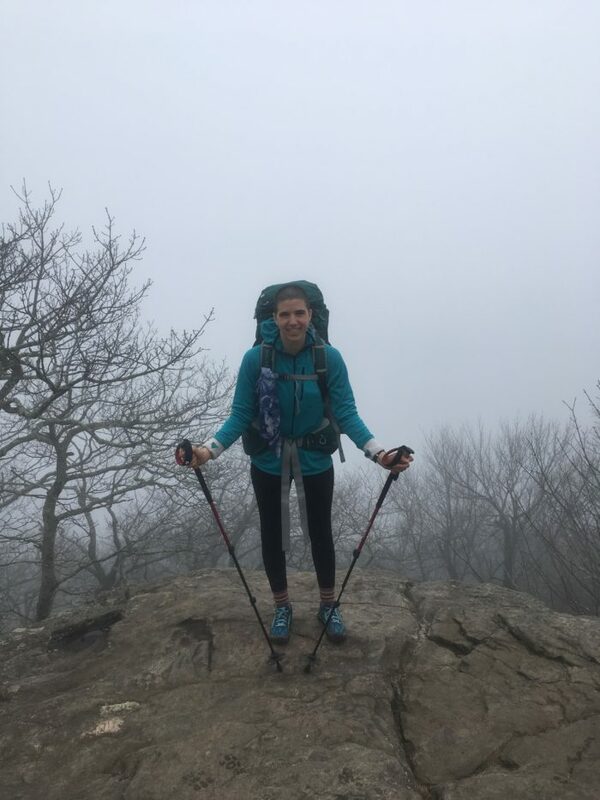 I woke up around 7:30 a.m. and by the time I made some gross, watery oatmeal and repacked my pack it was 10 a.m.
My second day was a pretty easy eight miles but it was far from boring. 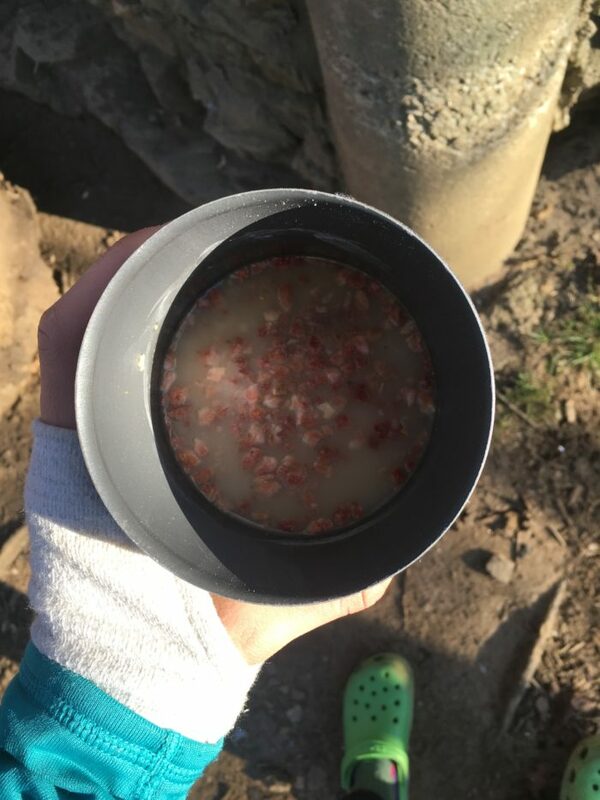 I had to filter water from a stream for the first time, I made my first water crossing, and I saw a glorified puddle with hundreds of tadpoles in it. I arrived at the shelter around 2:30 p.m. For the first hour at camp I lay inside my tent reading and stretching. 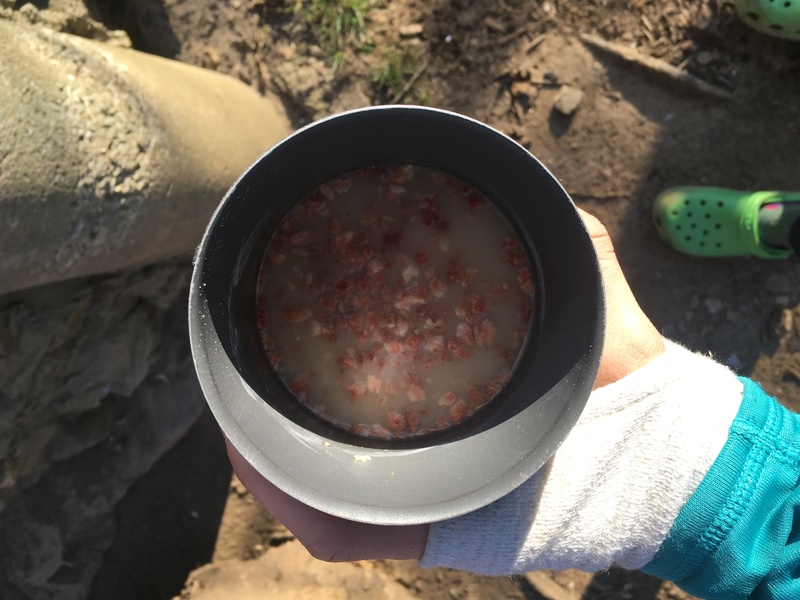 I made my first dinner on my camp stove of mashed potatoes and salmon. It was way too much food but there are no trash cans in the woods so I had to eat it all or the critters would come to camp to find it. We made a fire again to hang out around and talk about our hike that day. We saw there was a snow and freezing rain storm coming Sunday night so a lot of us discussed our hiking plans for the next couple of days to try to avoid it. When I retreated to my tent around 8:30 p.m. an owl sung me to sleep. Day three wouldn’t be as easy as day two. I was aiming for a 15-mile day to set myself up for a shorter day Sunday to get to Neel Gap, where my family could pick me up for my first zero day. Saturday I hiked in my first rain; I got very lucky with perfect weather my first two days. I also had my first trail magic Saturday. Trail magic is when people do kind things to help out the hikers. A church group had set up a tent with water, trash cans, food, and candy! I wasn’t ready to stop for the day so I grabbed an apple and a couple of York Peppermint Patties and kept hiking. A couple of miles down the trail I got to a campsite that had an outhouse and more trail magic. There were hot dogs, hamburgers, pulled pork, pudding, cookies, fresh fruit, soda, alcohol, and a fire. Having already hiked 12 miles that day I decided to set up my tent. There were a few familiar faces at the campsite, which made my decision even easier. The trail angels were some guys who love the AT and provide trail magic every year during a weekend camping trip. It stormed all night but everything inside my tent, including me, stayed dry. The trail angels made pancakes for breakfast and I set out around 9:30 a.m. I had an 11-mile day standing between me and my first day off. Most of the hike was up Blood Mountain, my biggest summit so far, so it wouldn’t be an easy day. It rained most of the day but I powered through the uphills. Blood Mountain summit. Check out that view! The last two miles down the mountain were a different story. It took me almost two hours because it was mostly open rock face, it was extremely foggy, and my knees were killing me. But I still got to my destination just before 4 p.m. My family picked me up and took me back to my aunt and uncle’s house. So I got to take a shower, eat great food, do laundry, and give my knees a rest. I have loved this adventure and everyone I have met so far. I am already excited to get back on trail tomorrow and keep on trekking north. Follow me on Instagram @Wieder_walks for more frequent photo updates.